When the first trailer for X-Men: First Class launched in February, my reaction was fairly lukewarm, but I think everyone could agree on one thing: the scene at the very end of the trailer in which Magneto drags a submarine out of the water using his powers is pretty damn cool. Now the folks behind the film have released a new still, and while it's from the same scene, unfortunately it's not the cool looking part. 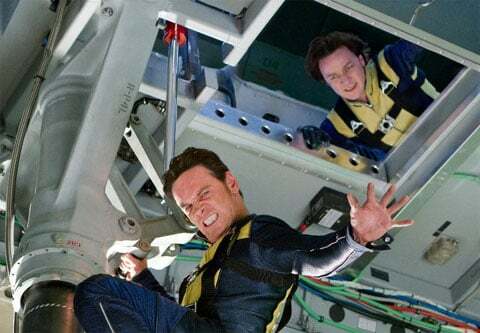 Posted on the X-Men Movies Facebook Page, we know that this new image comes from the submarine action sequence because of the trailer, but without seeing the giant piece of machinery being lifted magnetically it looks as though Magneto, played by Michael Fassbender, is either dealing with a bad case of constipation or is palming the largest invisible basketball in the world. A wide shot showing the future villain hanging out of the jet with the sub in the distance would have been much more effective, but perhaps there isn't a still from the movie that illustrates that. Check out the image below or click it to see it in high res over in our Blend Film Database.